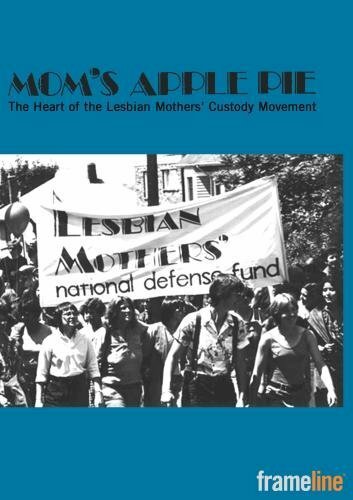 DVD purchase price includes Public Performance Rights.While the LGBT Civil Rights movement was gaining momentum, the 1970s witnessed horrific custody battles for lesbian mothers. Mom's Apple Pie: The Heart of the Lesbian Mother's Custody Movement revisits the early tumultuous years of the lesbian custody movement through the stories of five lesbian mothers and their four children.Narrated by Kate Clinton, the documentary interviews the sons and daughters who were separated from their mothers, the mothers themselves, and one woman who made the difficult decision to flee with her children. Founders of the Lesbian Rights Project (now the National Center for Lesbian Rights) and the Lesbian Mothers' National Defense Fund recount the founding of their organizations in response to the bevy of court rulings granting custody to grandparents, fathers and distant relatives based on the belief that lesbians would be unfit parents. Rich with archival photos from JEB (Joan E. Biren) and Cathy Cade, the documentary also features music from iconic lesbian musicians Margie Adam, Alix Dobkin, Mary Watkins and Cris Williamson.This product is manufactured on demand using DVD-R recordable media. Amazon.com's standard return policy will apply. If you have any questions about this product by Frameline, contact us by completing and submitting the form below. If you are looking for a specif part number, please include it with your message.